Since 1997, Northwest Fiberglass Inc. has been the premier provider of restorative boat services to Lake Conroe, TX. From fiberglass repair, to gelcoat restoration, to painting and even full boat restoration, we do it all! We’re committed to you and your boat. Get in touch with us today! Owning a boat means keeping up with all of the maintenance and repairs that come along with it. 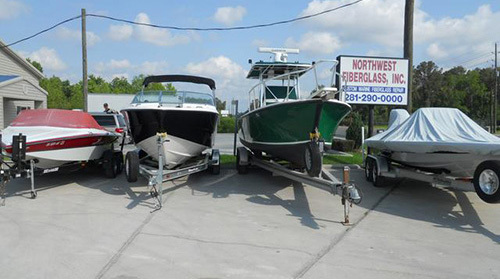 At Northwest Fiberglass Inc., our aim is to provide you with every degree of boat repair in Lake Conroe, TX you might need to maintain a boat that’s always ready to hit the water. If it’s made of fiberglass, our repair professionals can fix it! Moreover, we’re also intimately familiar with everything needed to maintain your boat’s gelcoat. We can repair and restore it as needed, while also providing you with finishing services that include metal flake repairs, painting and waxing. Your boat is bound to look like a million bucks when we’re done with it. All of our repairs carry a warranty! We’re a member of the National Federation of Independent Business. We’ve been in business since 1997, with a depth of experience behind us. We have locations in North Houston and Lake Conroe for your convenience! We have the capacity to assist you with insurance claims, to facilitate quick repairs. No matter what your boat needs to stay looking its best, Northwest Fiberglass Inc. is ready to provide you with service. Contact us today for more information or to request a quote.